What don't you know about asparagus? 1. It takes three years from seed to harvest. Once they get going, asparagus plants can be cropped each spring for 15 years or more, but the spears start out the diameter of pencil lead in year one. The mini-spears eventually grow into a ferny, waist-high canopy which feeds the underground rhizomes with energy synthesized from the sun. The plants gain strength in year two and by the following spring, some of the spears are reaching the full diameter of a pencil, signaling they’re ready to harvest. 2. Everyone makes “asparagus pee,” but not everyone can smell it. Scientific study has confirmed why some individuals don’t notice the uniquely pungent urine experienced by others after eating asparagus: The sulfurous compounds in asparagus pee are highly correlated with a condition called “specific anosmia,” the genetic inability to smell certain odors. In an infamous blind smell test, 328 individuals were subjected to the odor of a man’s urine after he had eaten asparagus. The majority of those who had experienced asparagus pee themselves were able to correctly identify the substance, while those that claimed their urine did not smell strangely after consuming asparagus were not. 3. Chickens can help farm asparagus. Rick and Marilyn Stanley of Chick Farm in Wells, Maine have conducted experiments on the subject and heartily recommend the practice. In their 2010 study, weed growth was reduced up to 90 percent after releasing their chickens in an asparagus field to forage – with no adverse effects to the crop. The Stanleys recommend a flock of about a dozen hens per 1000 square feet of asparagus. 4. China outdoes the world in asparagus production, by far. Though productivity has slowed in recent years, at last count there were still 57,000 hectares of asparagus in China. The next closest competitors? Peru has 27,000 hectares in production, while Germany is close behind with 22,000. The United States ranks fifth with about 14,400 hectares, virtually all of which is in California, Washington and Michigan. 5. Oceana County, Michigan is the self-proclaimed asparagus capital of the world. The county produces two-thirds of the state’s spears and hosts the National Asparagus Festival in June each year to celebrate the harvest. Unfortunately, America’s War on Drugs has caused a decline in the local industry. The United States pays Peruvian farmers to grow asparagus instead of coca, depressing the global price of asparagus and making it an unprofitable proposition for American farmers. 6. White asparagus is not genetically induced in any way. Instead, the lack of pigment in albino spears results from the absence of sunlight. Farmers pile soil over the emerging spears and cut them off from below to produce the ghostly novelty. Purple asparagus, on the other hand, is a genetic variety. But don’t get too excited – it reverts to green when cooked. 7. White asparagus is one of the most labor-intensive vegetables to grow. Every spear is hand-picked just as the tip begins to show through the surface of the soil. Farm workers carefully excavate around each spear to a depth of nine inches and clip it at the base. It must be placed immediately in a dark box so it stays white. Interestingly, white asparagus turns pink when exposed to sunlight, though there is currently no market for this color of asparagus. 8. Sea salt was the asparagus farmer’s original herbicide. 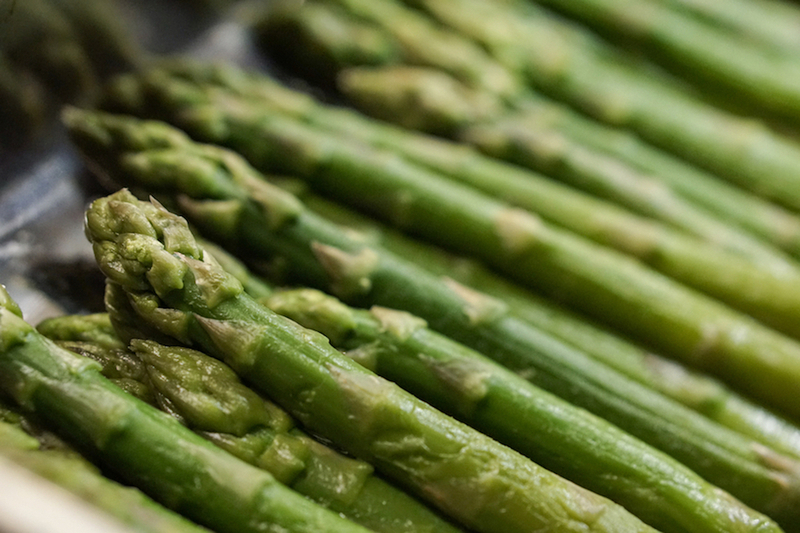 Originating in the sandy, sometimes salty, soils of the Mediterranean basin, asparagus tolerates salinity better than the majority of common weeds. Modern farmers often rely on chemical herbicides to manage weed growth, the most labor-intensive aspect of asparagus production, but rock salt was the old-fashioned alternative. This doesn’t come highly recommended, however – asparagus may tolerate salt, but adjacent plants won’t. The salt also forms a hydrophobic crust on the soil, leaving the asparagus asking for water. 9. Asparagus plants exhibit sexual differentiation. Seed-grown asparagus results in a 50/50 mix of male and female plants. The flowers look slightly different between the two and the female plants produce a red berry, a diversion of energy from vegetative growth that makes them less productive per acre. For this reason, the main commercial asparagus varieties are genetic male clones. 10. Love of asparagus inspired an ancient Latin saying. The emperor Caesar Augustus would bark “Velocius quam asparagi conquantur!” or “Faster than cooking asparagus,” which can be loosely translated as, “Get going already!” Augustus was such a connoisseur of the elegant vegetable, he organized elite military units to procure it for him. The famed Asparagus Fleets made rounds in the empire to import the best varietals back to Rome, while the fastest runners were employed to carry fresh spears high in the Alps, where it could be frozen for later use.